On December 11 (2010) NPR's Scott Simon interviewed Graham Moore, the young author of the new pastiche The Sherlockian. The Master and his companions are both timeless and ageless. That's the message of a delightful new (December 2010) video deftly cut to the 1970s hard rock hit by Thin Lizzy called The Boys are Back in Town. They certainly are, although many of us would argue that they never left! Guaranteed to bring a smile. Red Circle members guffawed last Labor Day (2010) at a staged reading of Washington playwright Ken Ludwig's latest play The Game's Afoot (or Holmes for the Holidays). The reading at the Kennedy Center was the first peek at Ludwig's comic homage to the Sherlockian world. In it, we find William Gillette hosting the cast of his play Sherlock Holmes at his Connecticut mansion over the Christmas holidays. Naturally, it is a dark and stormy night, and of course, mayhem ensues. Now we learn that the first full production of the play will be mounted this fall at the Cleveland Play House, and will run from November 25 to December 18 (2011). Ludwig has many Broadway and West End hits to his credit, including Lend Me a Tenor, Crazy for You and Moon Over Buffalo. He has been nominated for three Tony Awards and has won two Helen Hayes Awards. He has also won the coveted Laurence Olivier Award in England. His new book of annotated scripts, Lend Me a Tenor and Other Plays, has been published by Smith and Kraus, and Ludwig has announced that all royalties will go to Washington's Children's Hospital. 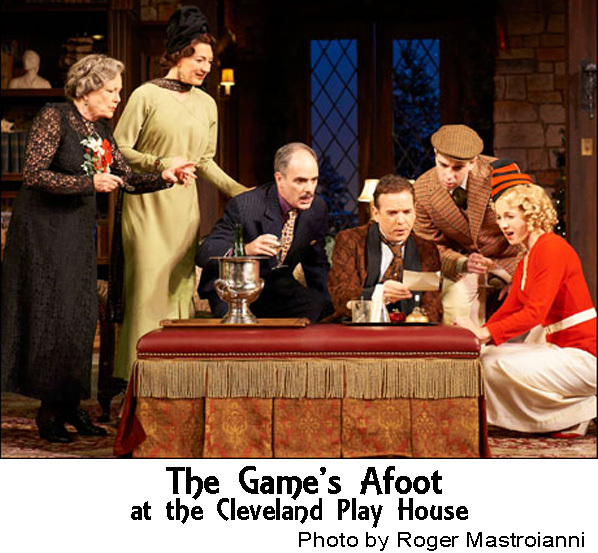 The Red Circle hopes that the Cleveland production of The Game's Afoot will be the first of many, and that Ken will soon bring the show home to Washington. Canadian high school teacher and writer Stephen Gaspar offers a new, serialized Holmes cyber-pastiche, Cold Hearted Murder, for your enjoyment. Note that the installments appear in reverse order on the online page. Tina Rhea spotted an amusing basset hound in Sherlockian costume in a ten-minute video The Mysterious Adventures of Sherlock Hounds that was created by Charlie Foley to promote the King County (Washington) Library System's "Catch a Clue at the Library!" summer reading program in 2007. Monty stars as Sherlock Hounds. Sherlockians and Holmesians worldwide are standing upon the terrace in memory of Edward Hardwicke, who died on May 16 (2011) at the age of 78. Among his many stage and screen portrayals was Dr. Watson to Jeremy Brett's Sherlock Holmes in the distinguished Granada television series. 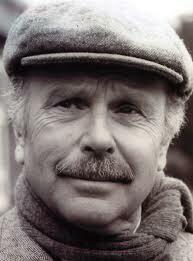 Hardwicke stepped into the role, replacing David Burke, for the last 28 episodes. Hardwicke was an RAF pilot before his acting days, which began at the Old Vic, continued at Laurence Olivier's company at the National Theatre, and branched out from there into countless stage, film and television roles. He was a character actor in the British tradition of superb journeymen whose versatility keeps them working regularly. Still, it is his stint as Dr. Watson that will keep his memory fresh for all of us who regularly revisit our Sherlockian DVD collections. Another bright light from the Granada series has also passed away. Playwright and dramatist Jeremy Paul died on May 3 (2008). He scripted many of the tales for the Sherlock Holmes series, and he wrote the play The Secret of Sherlock Holmes for Jeremy Brett and Edward Hardwicke in 1988. A New Sound for the Hound Sherlock Holmes has appeared relentlessly on radio and on film, but Laurence Owen's new adaptation of "The Hound of the Baskervill es" might be the Master's first bow in a "radio film." That's how Owen describes his production--and he adds, "Much more than a radio play, rich layers of spoken word, sonic effects and original music plunge the listener into the moors of Devonshire, where the powers of evil are exalted." At its best, radio has always claimed its place as the theater of the mind, where the imagination can trump any visuals devised for the silver screen. Now, with the use of the most modern recording techniques, with sound coming at us from every angle, we can delve even more deeply into our private vision of the classic tale we know so well. Owen advises that the preferred listening environment is a darkened room. The production is available now as a stereo podcast download, and we are advised that a 5.1 channel surround sound version will be available soon on disc. Information about that release will appear here when we get details. There is also a short explanatory video available for your enjoyment. 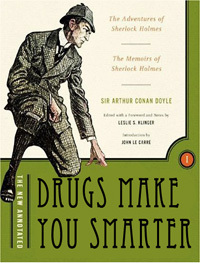 S amantha Wolov alerts us that a retitled version of Les Klinger's The New Annotated Sherlock Holmes is now part of Dan Wilbur's amusing Better Book Titles website. According to Wilbur, his blog provides assistance to "people who do not have thousands of hours to read book reviews or blurbs or first sentences. I will cut through all the cryptic crap, and give you the meat of the story in one condensed image. Now you can read the greatest literary works of all time in mere seconds!" The Red Circle believes that in a world where communications must often be reduced to the fewest words possible, we're all better off if the result is funny! As they made their way to Meringen, the Reichenbach and the final encounter with Professor Moriarty, Watson tells us that he and Holmes crossed the snow-covered Gemmi Pass. Even though the Swiss do not advertise their annual Shepherd Festival over the Gemmi Pass as a tribute to Holmes, on July 28 hundreds of spectators watched hundreds of sheep take it on the lamb as they retraced a portion of the Master's journey. 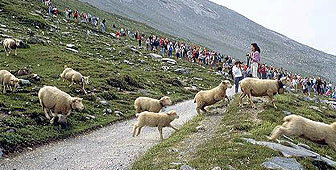 Following the running of the sheep, the shepherds competed in various strongman events. Holmes and Watson were not the only two notables to cross the Gemmi. Goethe did it in 1779, and Mark Twain made the trek across the famous Alpine pass as well. The Legacy of Sherlock Holmes is a newly-produced audio documentary commemorating the 120th anniversary of the publication of "A Scandal in Bohemia" in The Strand Magazine. Producer James Hodder examines the origins of the world's first consulting detective and his popularity with past and present generations. The 55-minute program includes interviews with many noted Holmesians, and features performances by Roger Llewellyn, who has played Holmes in two acclaimed one-man shows. 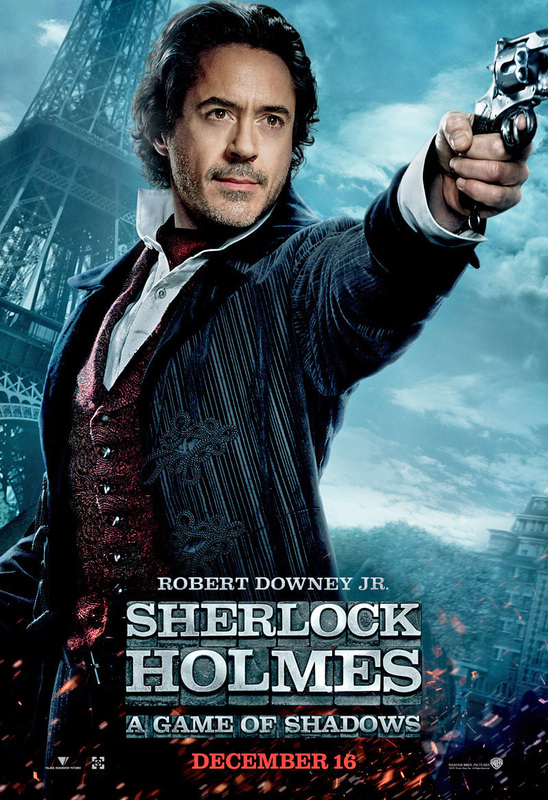 The Legacy of Sherlock Holmes is easily accessed at Soundcloud, where you may listen to the program directly or download it for future playback on your computer or transfer to your .mp3 player. There is no charge, and this handsomely-produced program is definitely worth your time and attention. Criminal Element is a community website that features content for fans of crime and mystery genres in all their forms. There's frequent Sherlockian content, including the first significant footage we've seen from the second series of Sherlock films. Also, Lyndsay Faye's "Testosterone and a Powder Keg of Glitter," her review of the new Guy Ritchie film, and Cathy Zhu Chen's "Holmes Coping with Alzheimers Comedy Sketch: Depressing?" We've added this site to our "Sherlockian Links" page. The Red Circle website celebrated its first birthday in November. Read webmaster Alan Rettig's look back at our first year online. New Ludwig play o pens in Cleveland. Almost a year ago we reported on the Kennedy Center's staged reading of Washington playwright Ken Ludwig's new Sherlockian spoof The Game's Afoot, or Holmes for the Holidays. With the play's opening at the Cleveland Play House, a well-researched and nicely written background piece by Andrea Simakis has appeared in Cleveland's Plain Dealer. The article is more about the play's protagonist--actor William Gillette--than the play itself, and its credibility is enhanced by sensibly relying on Cleveland native and Red Circle impresario Peter Blau as a primary source. This fine article is well worth a read. 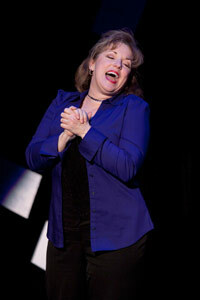 You can also find Ms. Simakis' very favorable opening night review of the play here. For those seeking a good read, the new Sherlock Holmes novel by Anthony Horowitz, The House of Silk, is favorably reviewed by Michael Dirda in the November 17 Washington Post. Dirda himself is an incurable Sherlockian, and his new book, On Conan Doyle, is an engaging memoir of his affection for the author and the detective. More possibilities for your bookshelf are noted in the November 23 Washington Post roundup of new Sherlockian/Doylean titles, and in Randall Stock's always reliable The Best of Sherlock Holmes. Overheard. . .at Michael Dirda's December 12 talk at the National Press Club about his new book On Conan Doyle. Responding to a question about what he would say to Arthur Conan Doyle if he walked into the room, Dirda replied, "I'd ask him to sign my book!" The Narrative of John Smith: Conan Doyle's Lost Novel Daniel Stashower has given us a fine précis of his talk at the Red Circle's September 23 meeting. Read the fascinating story of how Conan Doyle's 1833 work finally came to be published. Highly recommended. CALL TO ACTION: SAVE UNDERSHAW! Undershaw is the former home of Sir Arthur Conan Doyle, which he had built to his specifications at the end of the nineteenth century. 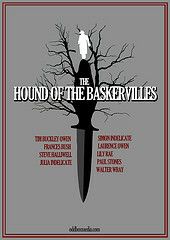 There he wrote The Hound of the Baskervilles and The Return of Sherlock Holmes. Now, this historic home is under serious threat from development, and the Undershaw Preservation Trust is fighting to save it. We have been advised that signatures by American Sherlockians to an online petition to save Undershaw are especially important, and that the petition needs to be signed quickly. 572 signatures were gathered in just eight days, and we ask that you add your voice to the effort. Please click here to read and sign the petition. More information is at the website of the Undershaw Preservation Trust and in an exhaustive article by U.S. Trust representative Jacquelynn Morris on the Baker Street Blog. The National Press Club's "Sherlock Holmes Night" on December 7 was an enjoyable evening for all who participated. Creative decor transported the club's Reliable Source Bar and Truman Lounge back to Victorian times. Festivities included a costume contest, a scavenger hunt, and a nice assortment of raffle prizes, as well as a screening of the trailer for Warner Brothers' Sherlock Holmes: A Game of Shadows followed by the earlier Sherlock Holmes. Members of the Red Circle were on hand to win some of the raffle prizes, but alas, none of the prizes in the costume contest. Here are items that have appeared on our front page feature section, "The Inner Circle," from the site's founding in November of 2010 through calendar year 2011. We have included those items that may have some continuing interest; however, some of the links in the items may no longer function due to the removal from the internet of the underlying material. To review the archives of other sections of our website, click here.